This CD contains technical and parts information on the Jaguar X300 or Jaguar XJ6/Jaguar XJ12 and Daimler range of cars manufactured from 1994 to 1996. 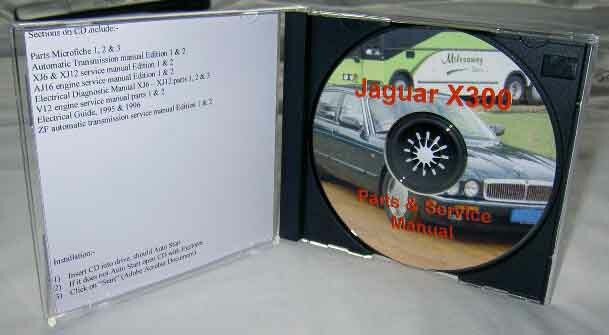 CD includes the Jaguar & Daimler Workshop manuals as well as parts catalogues. XJ6, XJR6, XJ12, Vanden Plas, XJ Sport, Double Six, Sovereign. CD contains scans of orginal workshop manuals as well as scans of the parts Microfiche for this model. If maintaining your own Jaguar or even for just gaining some additional knowledge on its operation this information is invaluable. From basic servicing to complete overhauls.